In my first years as a dentist, before completely dedicating myself to endodontics, I practiced all the dental disciplines. I performed extractions, amalgam restorations, composite resin restorations, crown preparations, surgical flaps and scaling. 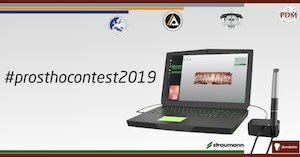 By doing this I could visibly check the working area (gingiva, core preparation, cavities before filling etc, etc) and thus I could directly verify the work as it evolved. With endodontics I could not do this. 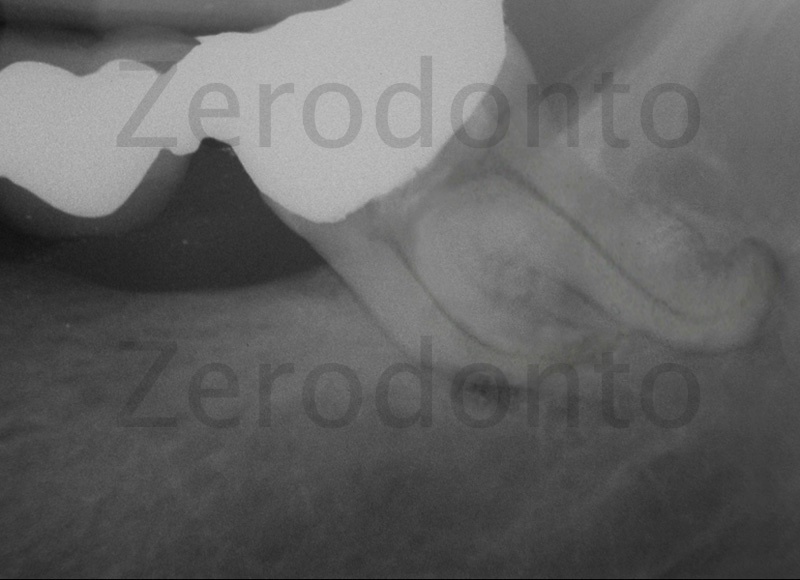 Even with radiology, magnification and the microscope, endodontics of the last few mm is always “in the dark” (especially with molars) meaning that we cannot for instance directly observe a K-file working as it files the apical third. 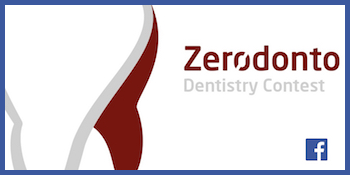 Its substantial difference from other disciplines of dentistry along with large anatomical variations and the complexities of the root canal system attracted me to this mysterious and fascinating discipline. I decided to dedicate myself completely to endodontics. As time went by I became convinced that practicing endodontics is a daily challenge against the hidden and unpredictable microanatomy. Maybe this is what makes endodontics so attractive! 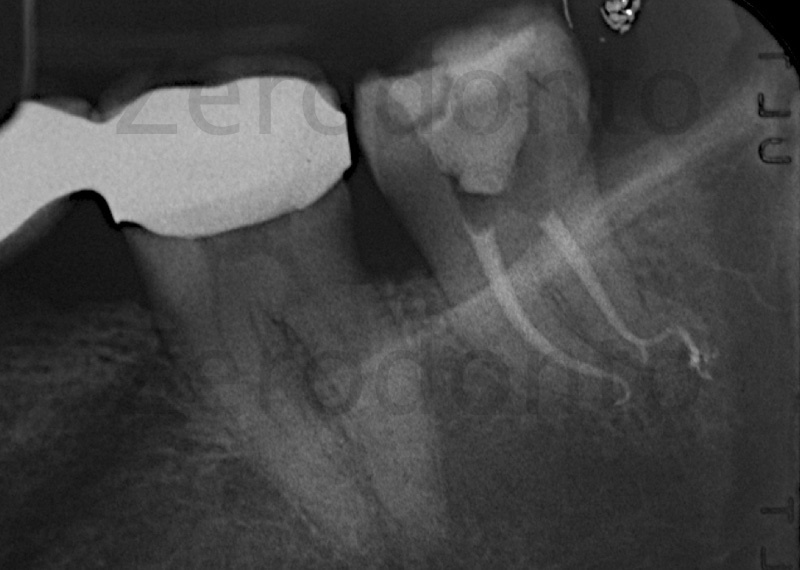 Now, after years of endodontics, I have a clear concept of complex anatomy and it seems limiting at this point to talk only of narrow, curved or long canals. A complex case is one which cannot be treated mechanically all the way to the apex, but which with a lot of good luck can be probed all the way to the apex with a small file. It, therefore, only requires biochemical treatment for the last few mm. However, it should be added that in 99% of cases it is possible to treat the full length of the canal up to the apex with manual and rotary instruments; therefore the incidence of these really complex cases is fortunately very low. 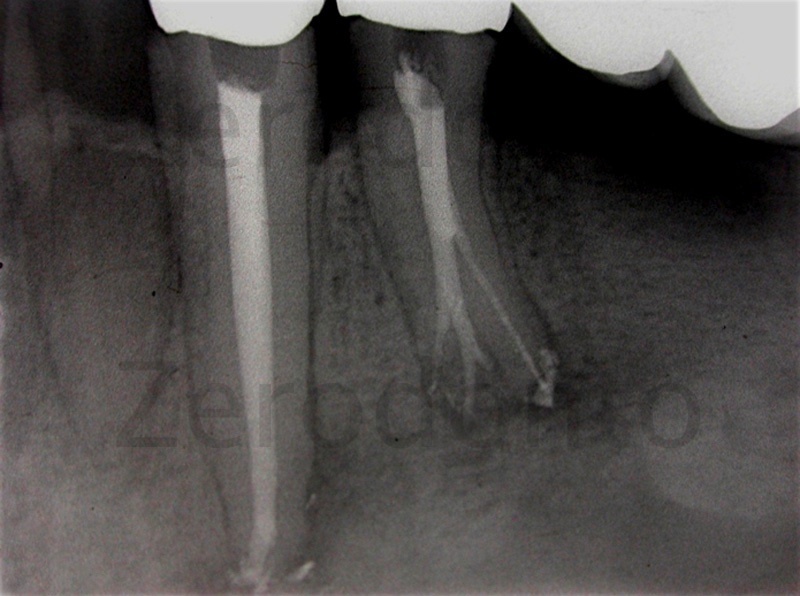 A complex case can be diagnosed pre –operatively with radiographs which reveal root profiles that are not common or canal spaces that suddenly become narrow and disappear. More frequently (during treatment) the clinician only becomes aware of the anatomic complexity when even the smallest file does not reach the apex. The scenario in the latter case is the following: once the coronaI interferences are eliminated, I attach a 0.6 pre-curved file to the electronic apex locator and with a watch winding movement I try to reach the foramen. 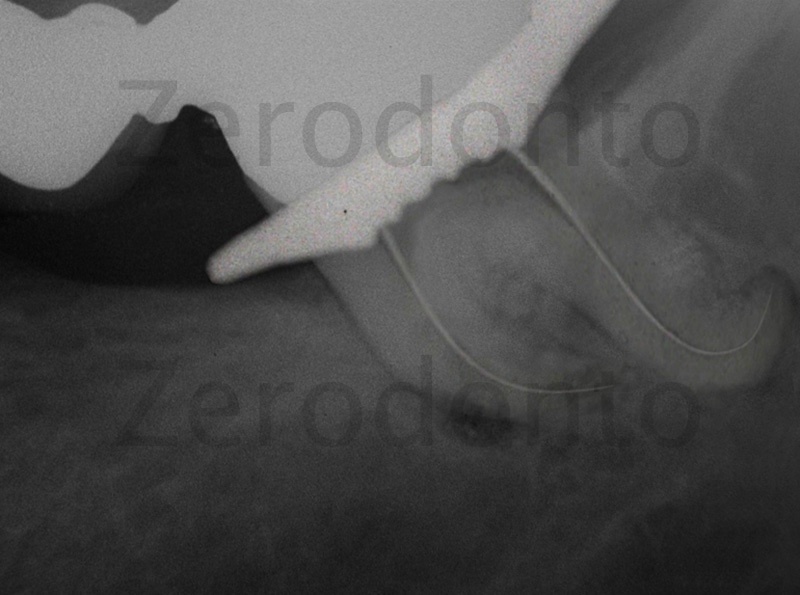 Not being able to reach the foramen, I remove the file and I take note of the plastic deformation created by the canal path. It is easy to deduce that the 0.6 file had to pass double or triple curves in different spatial directions before terminating maybe only a few fractions of a millimeter from the foramen. This is a complex case! 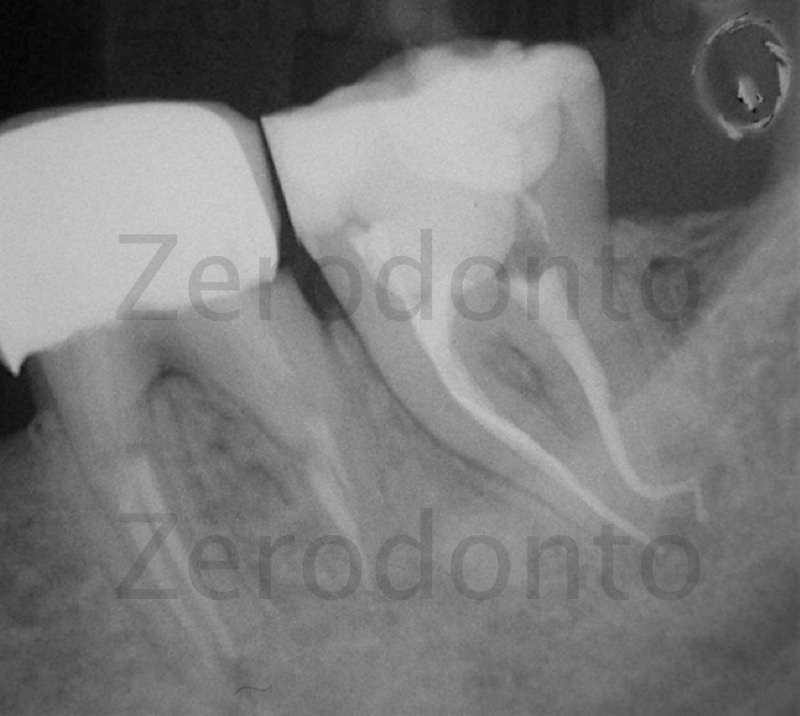 This never happened and as in the worst endodontic nightmares, the final result was always the same: a waste of many small files and a short obturation. Using these experiences to my advantage, I changed my strategy and the results fortunately changed as well. I now give the 0.6 file just one chance to descend into “the hell” of this complex anatomy and I do not persist with repeated and useless attempts which do nothing more than irremediably compromising the case. Indeed in spite of the flexibility of the small files it probably creates tiny ledges and notches which in this type of anatomy become insurmountable obstacles. 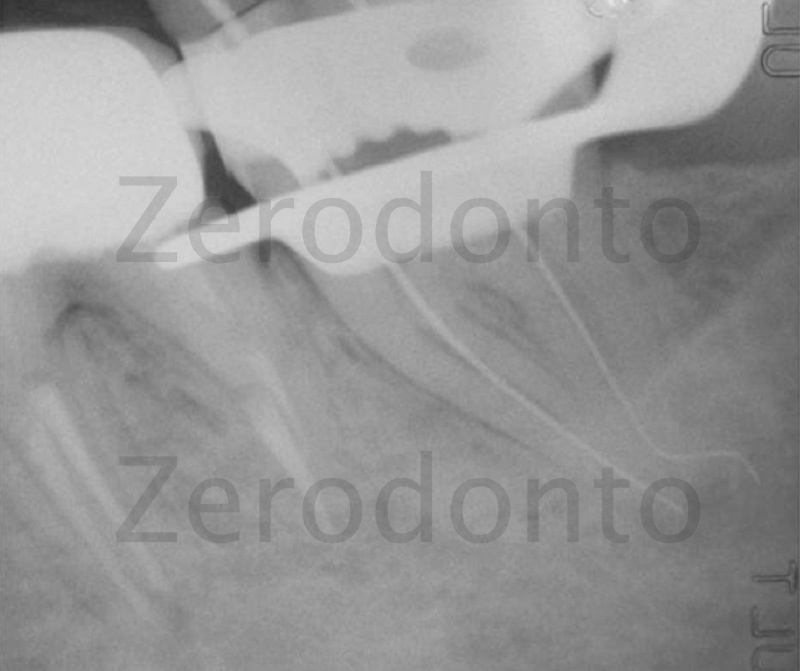 If the first attempt with the 0.6 file reaches the apical foramen, then I am satisfied because I now have the working length exactly and I also know that I am dealing with a very irregular canal. If I do not reach it I don’t despair, I don’t panic; I know that I have a very difficult canal and that maybe I am very close to the apex. In both cases I stop manual and mechanical instrumentation a millimeter from the start of the irregular tract and I will treat it biochemically using irrigants. This strategy is derived from the knowledge that the endodontic anatomy with its most irregular configurations is both beautiful and insidious at the same time. From a practical point of view this means that we must not insist on challenging it armed with instruments, but we need humility and patience and must trust in the subtle action of the irrigants. 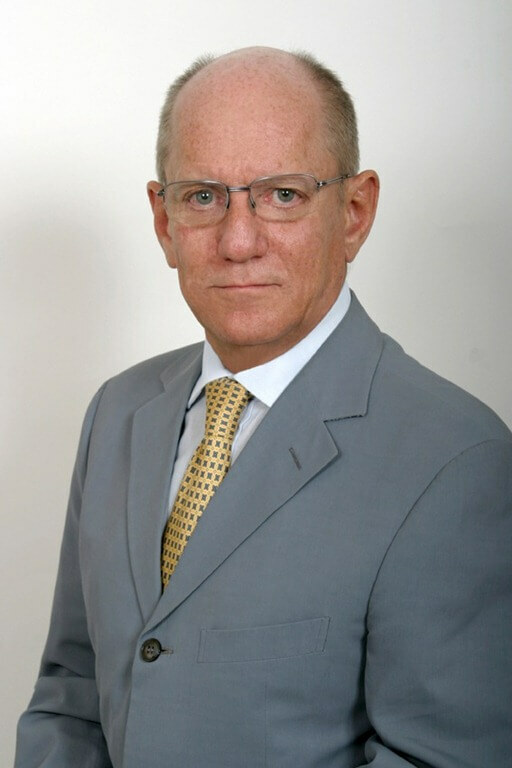 I am convinced that the ideal treatment of the irregular micro-space is biochemical emptying and three dimensional filling with warm gutta percha and cement. Another aspect is that of predictability. Indeed, I think that this strategy allows less experienced or less gifted operators to attempt to solve complex cases by using instruments we keep a safe distance from the irregular tract and we can leave the treatment of this part to the irrigants. In other words, in complex cases I think this approach is more predictable than an approach based on an “attempt” to shape an area that is very irregular. The key factor in these abnormal cases is that the treatment time cannot be the same as that required for simple cases: in other words time must be allowed for the irrigants to do chemically what cannot be done mechanically. Initially I thought of treating these cases in two visits, the first appointment for preparing the access cavity, shaping and initial irrigation, followed by a second appointment to complete the case, dedicated almost entirely to irrigation (considering that the obturation actually only takes a few minutes). Soon after though, I became convinced, for many reasons, that even for these cases a single visit was preferable. I, therefore, extended the treatment time which was advantageous for both the irrigation and the end quality of the completed treatment. The total time dedicated to rinsing with the irrigants at the end of the shaping is actually no less than 60 minutes. During a dental congress I showed my protocol to a colleague who had a vast knowledge of the literature and was also are searcher at a university. He was shocked by the long irrigation time and objected, saying that such a long irrigation time could be detrimental to the radicular structure in that it would weaken it. A correct observation, but far from the clinical reality of these complex cases. In my opinion it is better to risk losing the tooth due to root fracture after a number of years rather than from an abscess or acute apical periodontitis soon after completing my treatment due to inadequate irrigation time for the irregular anatomy. If we analyze this question from a logical and then physical point of view we realize that what makes the difference between simple and complex cases is the necessity to irrigate for a longer time. In simple cases I am reasonably sure of being able to take the irrigant up to the end of the canal, indeed the means by which the irrigant is placed can let you get near to the foramen (irrigation needles with the positive pressure technique) or actually reach it (micro-cannula with a negative pressure technique). 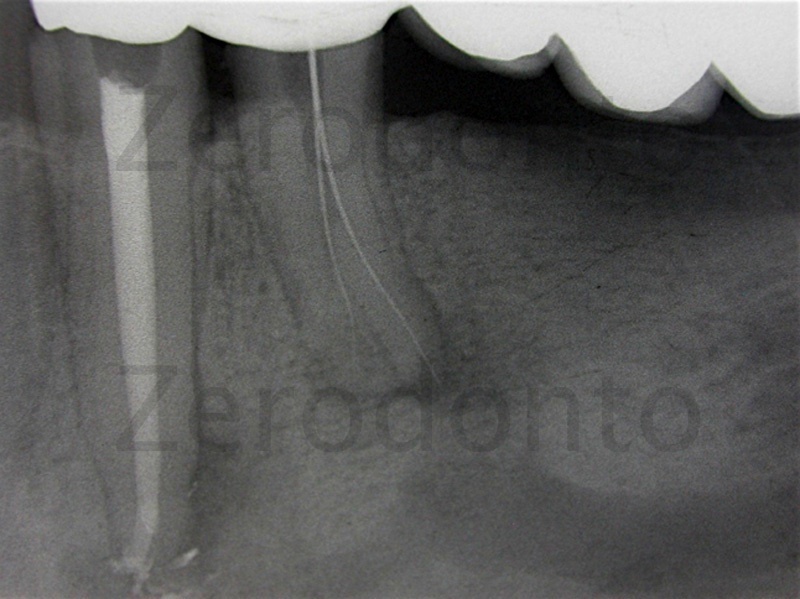 In complex cases, no matter what technique is used the irrigant is deposited a long way from the apical third or at best near it. The possibility of the irrigant solution reaching the canal end is, therefore, left to the intrinsic capacity of the irrigant to flow along the dentinal walls. Physics tests have studied modules that simulate the root canal (closed-end micro channels) and the air entrapment by the advancing liquid front is a well recognized physical phenomenon. The ability of the liquid to penetrate these closed end channels is dependent on the contact angle of the liquid as well as the depth and size of the canal. 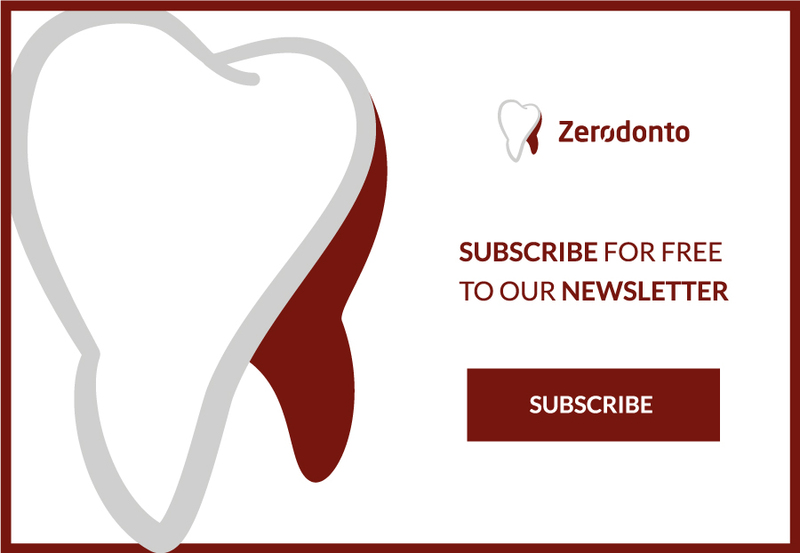 This phenomenon of air entrapment and the time frame in which complete flooding occurs has practical clinical applications, indeed endodontic irrigations are performed within a time frame of minutes instead of hours or days. 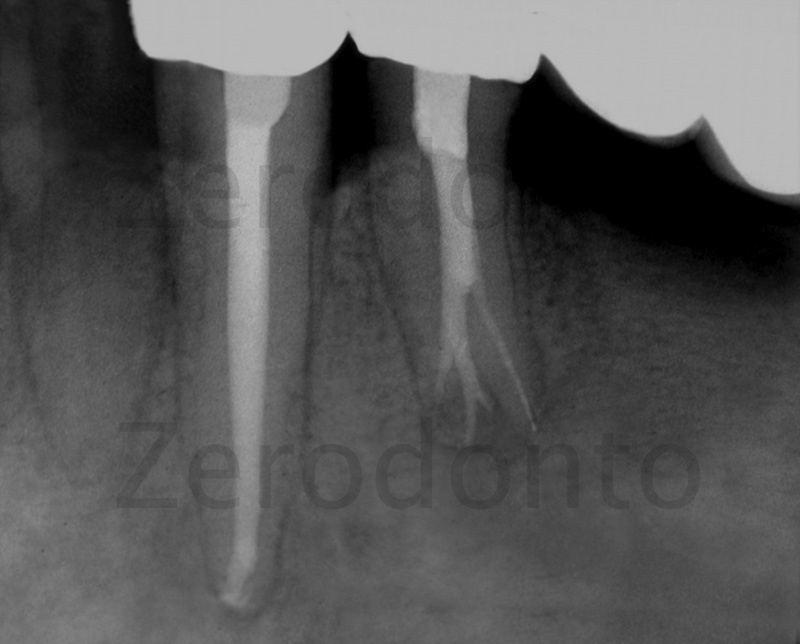 The risk, in this anatomy, is that the irrigant will never reach the apical third if you don’t give it enough time. 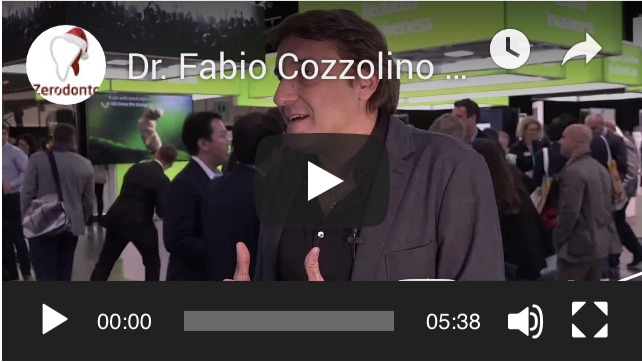 This concept must be kept in mind: in very complex anatomical cases I expect the irrigant to not only flow along tortuous and irregular tracts but also to do something which the instruments normally do, that is to open up the space. A miraculous irrigant does not currently exist, so give it all the rime it needs! Figure 1: One of the splendid anatomical studies by Prof. W Hess in 1920. The last millimetres of the distaI root present an enormously irregular tract and represent a limit for the instruments, irrigants and obturators to reach working length. Figure 2: Preoperative radiograph: unfortunately for us this anatomy does not only exist in Hess’s anatomical plates but also in our patients’ mouths! 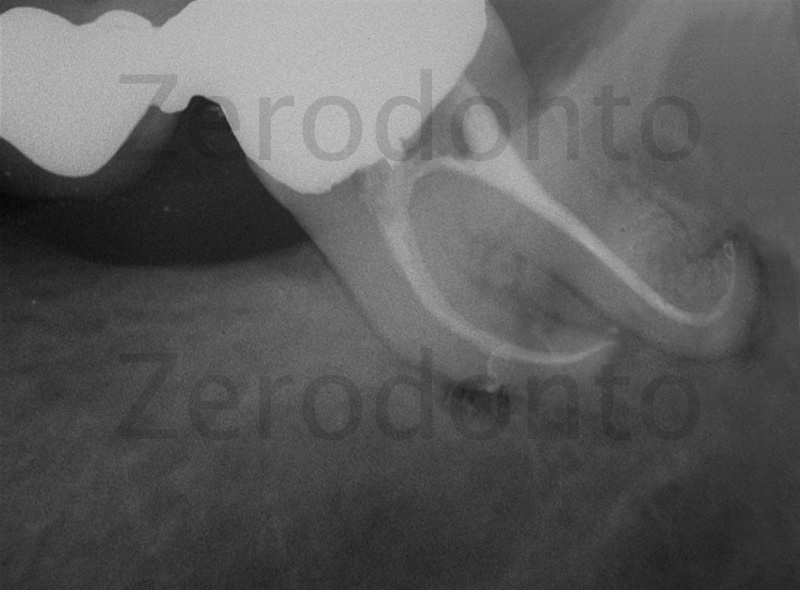 Figure 3: Post operative radiograph: the gutta percha and cement fill the anatomical space which is very similar to that presented by Prof. Hess shown in all its glory. 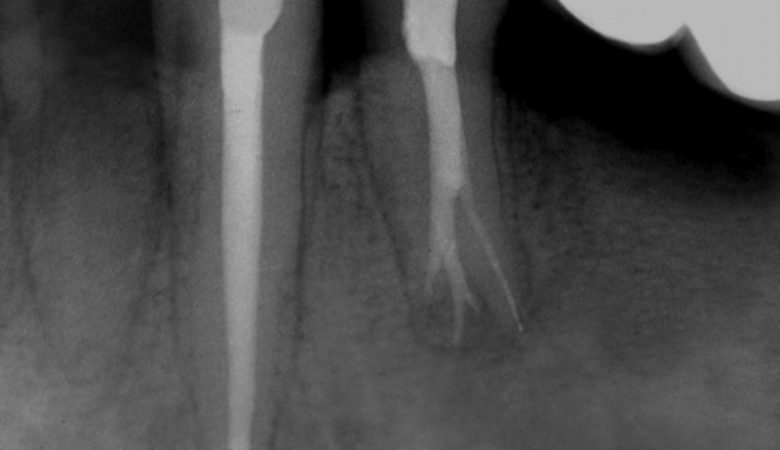 The treatment of the last 3 mm of the distal root was performed biochemically so that this space was empty and during the obturation phase it was filled thanks to a carrier-based obturation. Figure 4: Pre operative: anatomic complexity is always ready and waiting. 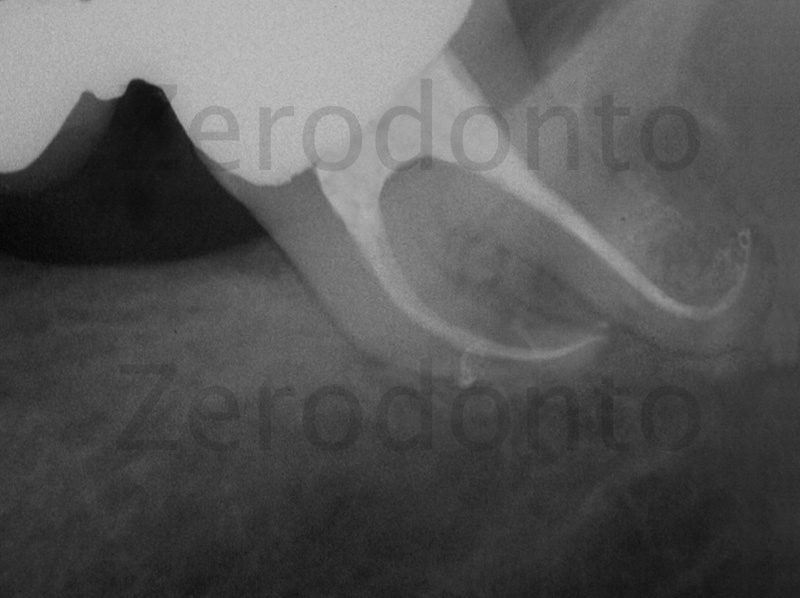 Figure 6: With good luck a K-file reaches the foramen of the distal canal probably aided by the absence of the pulp. 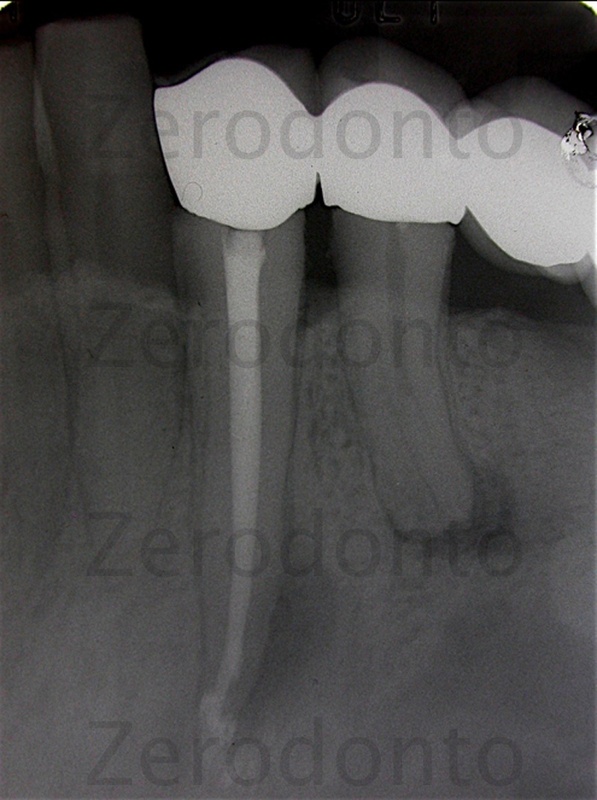 Figure 7: The post operative radiograph shows an irregularity similar to the previous case. 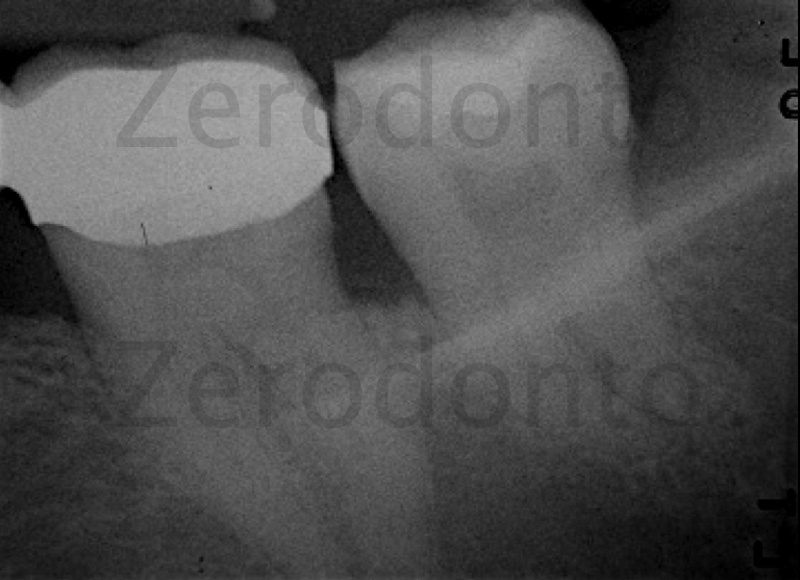 Figure 8: First lower left premolar with acute apical periodontitis: please note the peri-apical radiolucency, the multi root profile and the canal space that disappears suddenly between the middle third and the apical third. Once the pulp chamber was opened I found a single canal which divided into 4 canals with 4 separate exit openings between the middle third and the apical third. Figure 9: Working length check of the first 2 canals. Figure 12: Six month check up shows the case had surprisingly healed. In my opinion, all things being equal anatomically, it is easier from a technical point of view to deal with necrotic cases rather than vital ones. Indeed during the phase of trying to reach the apex, the pulpal tissue present in the apical third could be a potential and dangerous obstacle for the small files we use in this phase. In anatomy that is already complex, with abrupt curves, double curves, bi- and tri-furcations, the very presence of pulp tissue is enough to deflect a small file, damaging it and preventing it from reaching the apex. 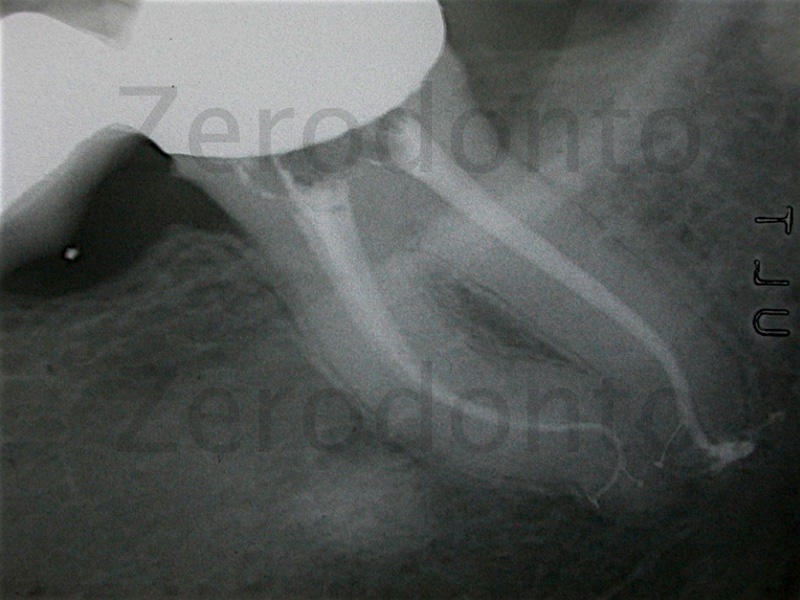 As regards vital teeth, if the pre-operative radiograph shows particular anatomical difficulties, we need to remove all the pulp as soon as possible in a single action, thereby removing this obstacle from the canal space opening up the lumen of the canal and allowing free passage of small files and irrigants. We very often become aware, while carrying out our endodontic procedures, of the anatomical difficulty of the last few millimeters of the canal. In these cases it is, therefore, impossible to remove all the pulp tissue intact and so the sodium hypochlorite does it for us. I also use these carriers with a gentle up and down movement to push the irrigants into the more complex and irregular areas of the endodontium. 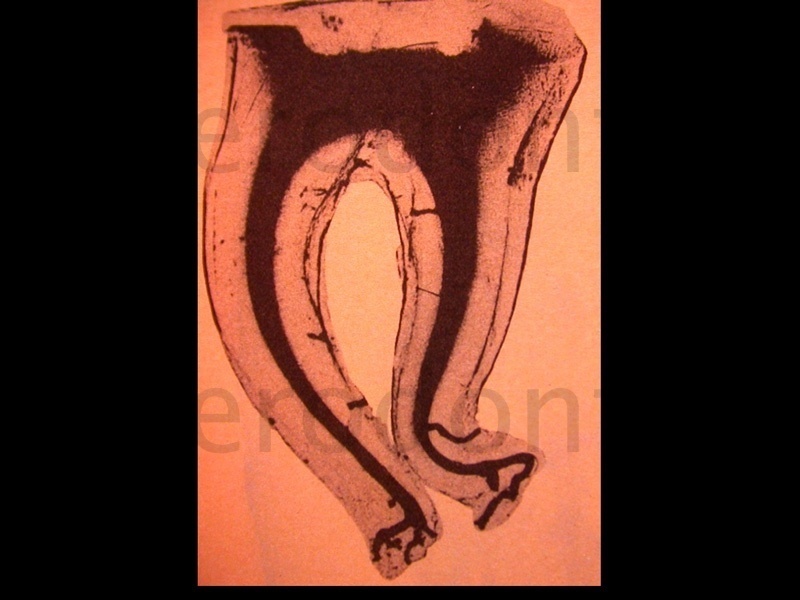 Figure 13: Acute pulpitis of a lower third molar bridge abutment. We can see from the preoperative radiograph that this is a complex anatomy that has large globular-shaped apices with a canal lumen which suddenly disappears in the apical third. 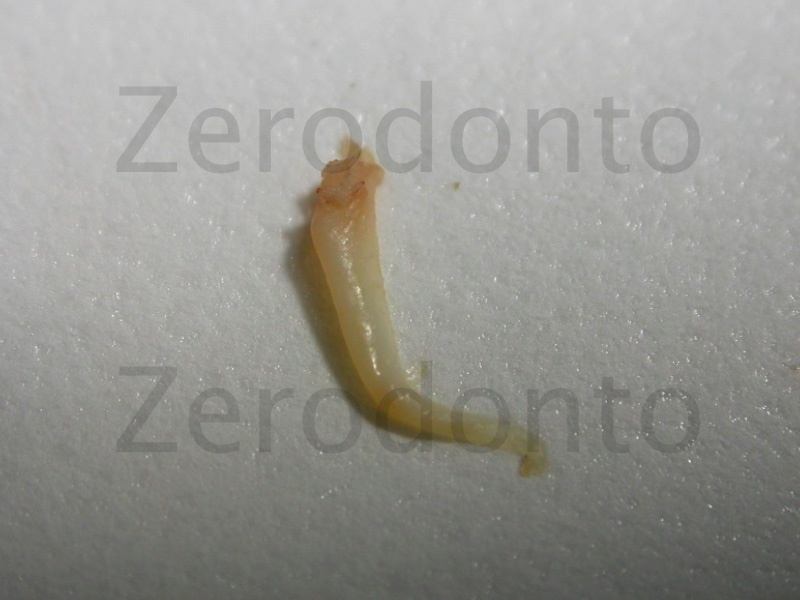 Figure 14: After managing to remove the pulp tissue from the mesial and distaI canal the working length is determined. The mesio-buccal and mesio-lingual canals merge in the coronal third and the mesio-lingual canal divides in two about 2mm from the apex. When I probed the canal with a small file I found that it had two different working lengths. 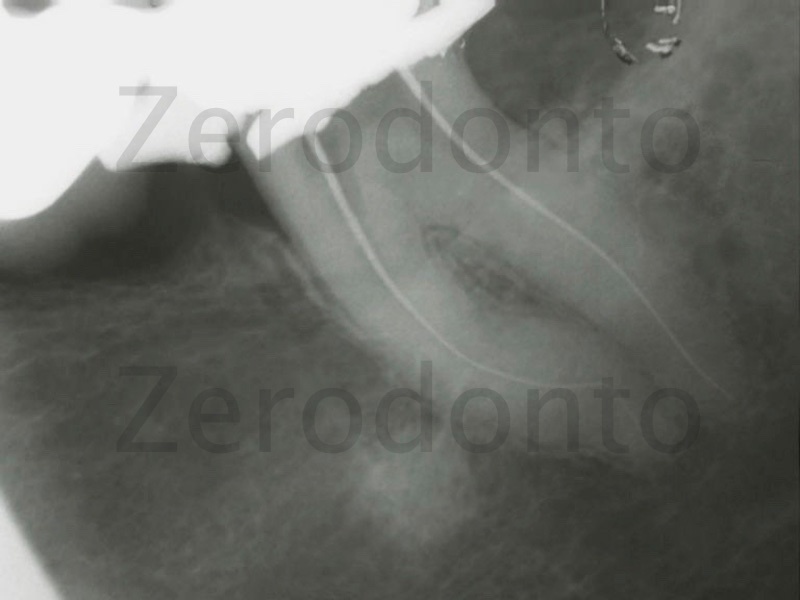 Figure 15: Radiograph with the second working length relative to the mesio-lingual canal. I decided to shape the mesio-lingual canal with nickel-titanium rotary instruments with a 2% taper called Pathfiles up to 1 mm from the bifurcation and then slightly shorter using GTX 20-04 and GTX 20-06. The bifurcation, once probed with small files, was treated only biochemically. 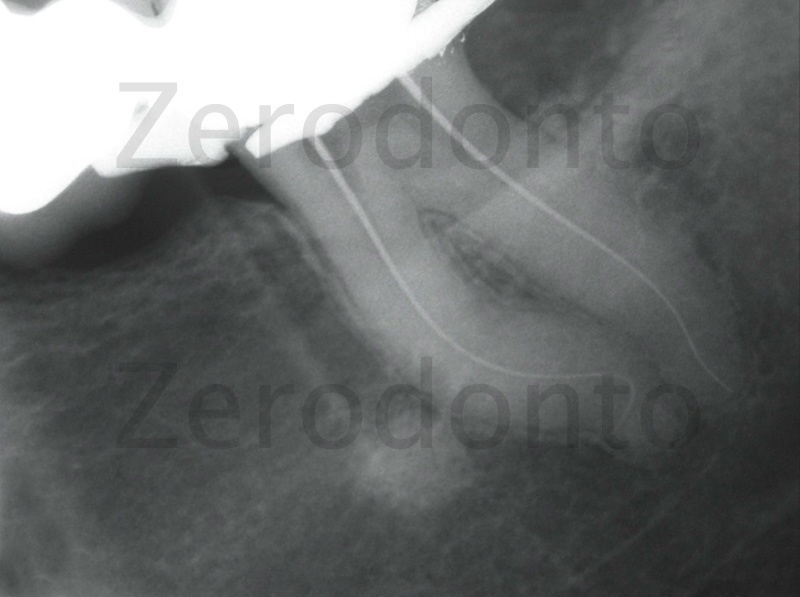 Figure 16: Obturation of the canals with GTX obturators. The canal anatomy in all its complexity and beauty. 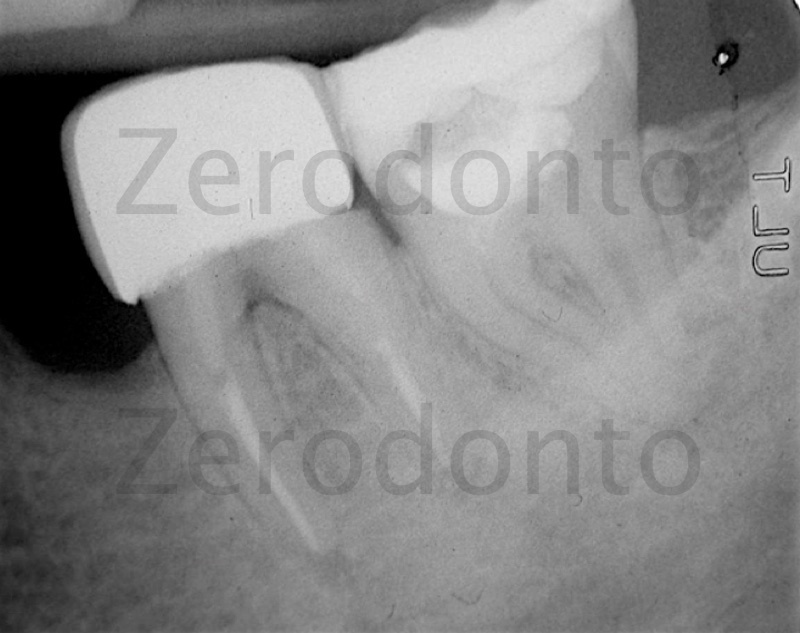 Figure 17: Acute periapical periodontitis of a lower second molar bridge abutment. 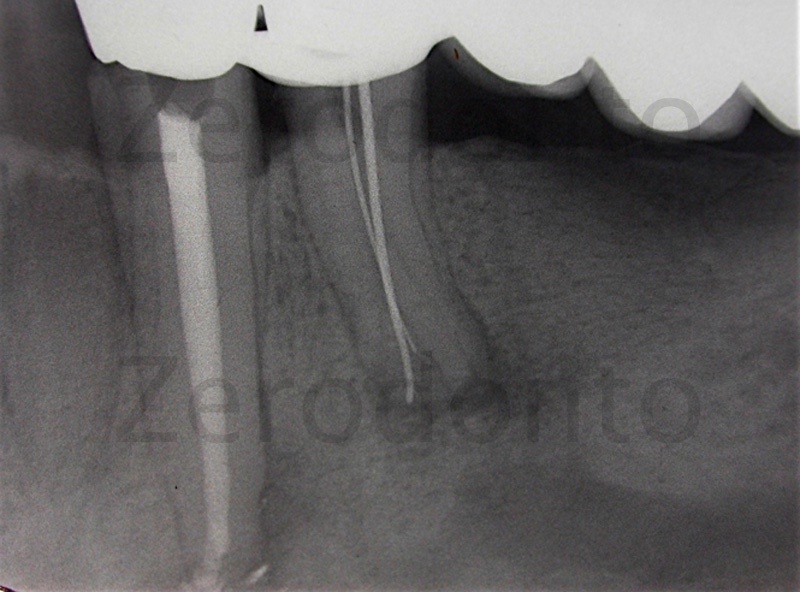 From the radiographic examination we can see a highly irregular and curved root profile of the distal root. 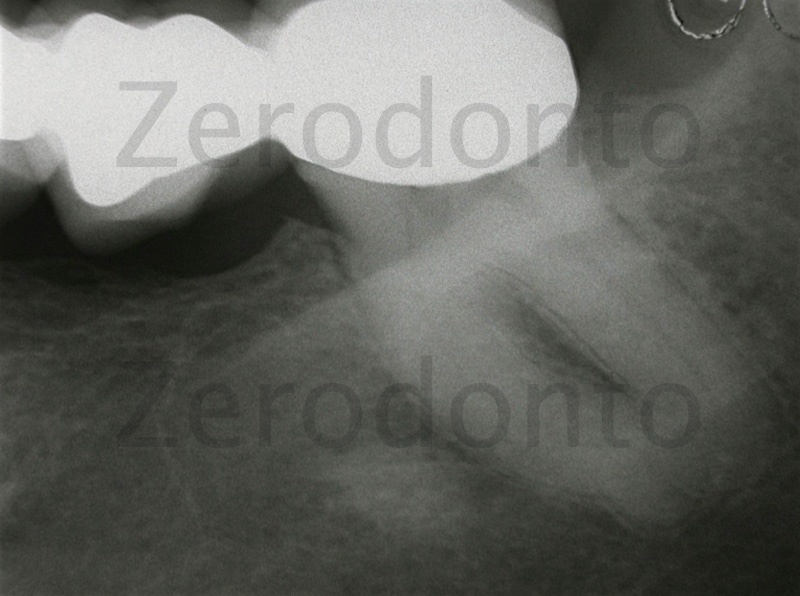 Figure 18: Radiograph of the working length. We can see the uncommon curve of the distal root distally and coronally. Mechanical treatment of the distal canal with rotary instruments with a 2% taper called Pathfiles up to the apical foramen and then slightly shorter using GTX 20-04 and GTX20-06. Figure 19: Obturation with GTX obturators. 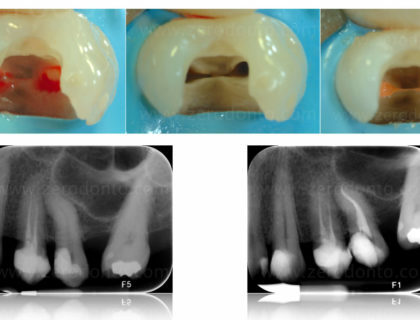 Figure 20: 6 month check up and complete resolution of the case. 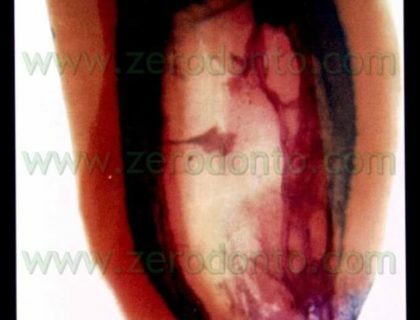 In vital cases, if possible, remove all the pulp tissue before introducing instruments into the canals. This is done very carefully using a barbed broach without descending deeper than the coronal third of the canal. In both vital and necrotic cases, after shaping the irrigation time is 60 min. Use an irrigant with surfactant. Renew the irrigant frequently and at the maximum depth. Agitate the irrigant by moving a gutta percha cone or plastic carrier up and down. 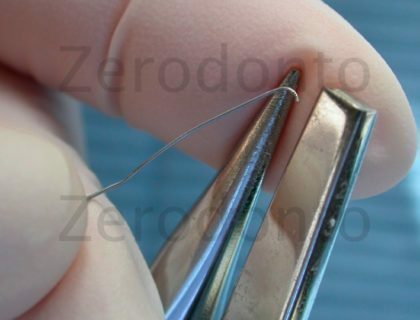 I am certain that of all the dental disciplines, endodontics is the most complex because we have to challenge and encounter a microscopic anatomy which is hidden, variable and complex. Only by understanding this can we approach the treatment with the necessary humility, patience and perseverance. Canal irrigation, in the light of current scientific knowledge and the availability of dedicated equipment, is a predictable procedure and offers a substantial contribution to the success of the whole root canal therapy. Nevertheless, in complex cases and faced with many new challenges I have often had to ask questions which neither colleagues nor books could answer and so I had to answer them myself. I am a clinician and my answers are not, therefore, based on the solidity of science but are covered by the mist of empiricism. Despite this I hope that my experience can be useful for other colleagues who, like me, love endodontics.